YOTEL HALLOWEEN ROOFTOP TERRACE PARTY MANHATTAN – TIMES SQUARE HOTTEST HALLOWEEN PARTY! ROOFTOP HALLOWEEN OF TERROR! HALLOWEEN ROOFTOP PARTY! 1 DAY - 1 EXCLUSIVE EVENT! 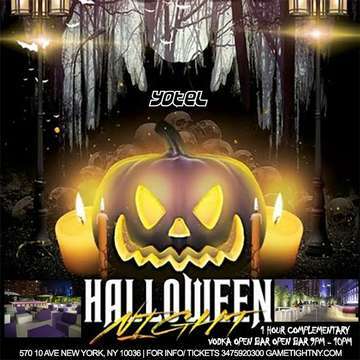 MUSIC BY NYC TOP DJS AT YOTEL NYC HALLOWEEN TIMES SQUARE ROOFTOP PARTY ! TICKET EVENT 21 & OVER ! HALLOWEEN PARTY @YOTEL NYC IN TIMES SQUARE MANHATTAN, NY! CAPACITY EXPECTED! BUY YOUR TICKETS NOW FOR JUST 20$! Yotel NYC Halloween Dress Code: Its Halloween – be creative! Yotel NYC Halloween Bottle Packages: Bottle Prices available by request. PLEASE READ AND REVIEW THE TERMS OF SERVICE BY PURCHASING YOU ARE AGREEING TO OUR TERMS OF SERVICE. AFTER PURCHASE NOTE: PLEASE CALL/TEXT US AT (646) 220-8460 OR (347) 592-0300 TO CONFIRM YOUR PURCHASE! DUE TO HIGH VOLUME OF TICKETS BEING SOLD, PLEASE ARRIVE EARLY TO AVOID LONG LINES - ALL SALES ARE FINAL! RECAP OF LAST YEAR AT YOTEL NYC HALLOWEEN!